Rod was in The Time Machine & Hitchcock’s The Birds. 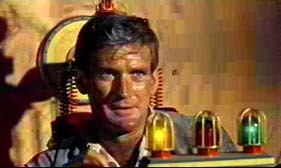 I’ve been a fan of Rod Taylor since I saw The Time Machine. And who better to take us through the narration of a story than the guy that most boys, and the young at heart, have taken the ride with him countless times in his machine. His narrative voice is strong and gentle at the right times and we trust him to guide us on our adventure together into the future. So for me, he was the only choice for my audio-book Rock Star Rising. We planned to start recording at 9 am. My producer and friend Larry Metzger and I decided to site in the plush building lobby and wait for Rod. The sound man was setting things up in the studio and everything was cool. Our chairs in the lobby faced the heavy glass recording studio door that had a bell on it. We were only 10 feet away, and since there was no one else in the lobby on a Saturday we would surely see Rod arrive. Suddenly in the midst of conversation the sound man comes out and says, “Rod’s here.” “He’s in the studio?” I said. “What? We were both looking right at the door. We would have seen him open the heavy slow door and heard the bell.” We jumped up and went into the studio. After a few more stories, I explained to Rod how we were recording in digital and that he could stop and repeat a line again any time he wanted. That any mistake could be easily cut out later. This was his first time doing it and was amazed how the technology progressed since he had recorded the voice of Pogo in the original 101 Dalmatians. Rod started out as contract player for MGM. He appeared in Giant and Separate Tables. He made it a point to appear only in good movies, turning down lower class productions, as he was,and is, truly interested in doing good work in a profession that her really respects. He gained fame with The Time Machine and the TV show Hong Kong where he became the highest paid actor for a one hour show. Rod solidified his star position with the Alfred Hitchock movie, The Birds. Fate is the Hunter, 36 Hours, and Dark of the Sun, showed he could chose imaginative and rugged parts. I was surprised when Rod made improvements to some of the lines I wrote and even found an “unnecessary and confusing” passage that he recommended I delete. When he explained it to me, I understood right away and deleted it. Rod was not only acting, he was processing the story and making additions and improvements. After finishing the narration, I asked Rod to sign a Time Machine photo for me. Instead of leaning over the table, he sat himself down as if preparing to paint a master piece, and signed it large and clear. A week later when Larry and I were again sitting outside in the lobby near the recording studio door, it finally occurred to me how Rod had gotten inside without us seeing him. “Larry”, I said, using a Scottish accent, trying to sound like Alan Young in The Time Machine. “Now I see. Rod drug his heavy machine over there, scratching the floor, so that he would appear inside the studio to record our production and make a better world for us.” I don’t know which three books he took with him. But I hope one of them is Rock Star Rising. 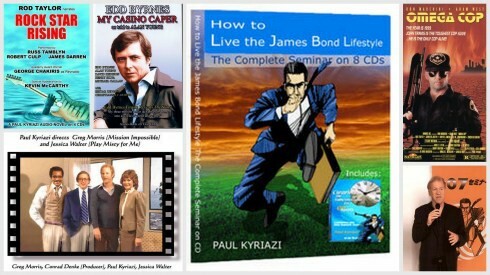 This entry was posted in Movies I Directed and tagged agent, alan young, alfred hitchock, audio book, audio-books, bodega bay, dark of the sun, george chakiris, giant, james darren, kevin mccarthy, movie directing, movie script, paul kyriazi, robert culp, rock star rising, rod taylor, russ tamblyn, screenplay, shamus, the birds, the glass bottom boat, the time machine. ← What Do I Do After Film School?